Welcome to Work Task Wednesday, a place where we will be talking all about different work task, work bins, task bins… whatever you call them, we will be talking about them! The benefits of using work bins for academic learning centers include promoted independence, practicing transitions, playing and engaging in multiple activities during a certain time-block of the day, cooperating and sharing with others, and an opportunity to provide students with a more hands-on approach to learning. Plus so much else, that’s just the start! The best part about using work tasks in the classroom is you can meet the needs of multiple learners in your classroom by having multiple work bins set up and ready to go. As the teacher, you are the facilitator of the learning… but centers allow students to have ownership over their learning. You guide, but they execute. 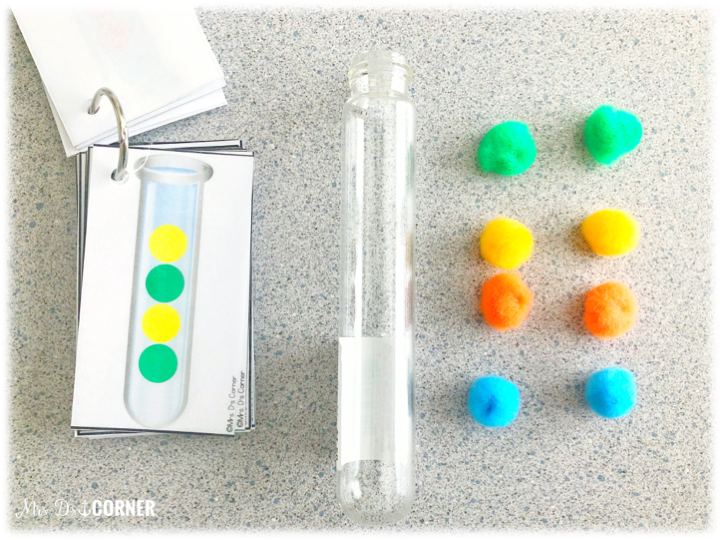 So today we are going to talk about just one work task you can begin implementing in your classroom: Test Tube Patterns. What skills does this resource practice and strengthen? Patterns and sequencing, color identification, following directions and/or the order of a task, fine motor skill practice (coordination of small hand muscles), hand dominance, grip, hand-eye coordination, and more. What supplies are needed to implement this resource? How do I use this resource in my classroom? 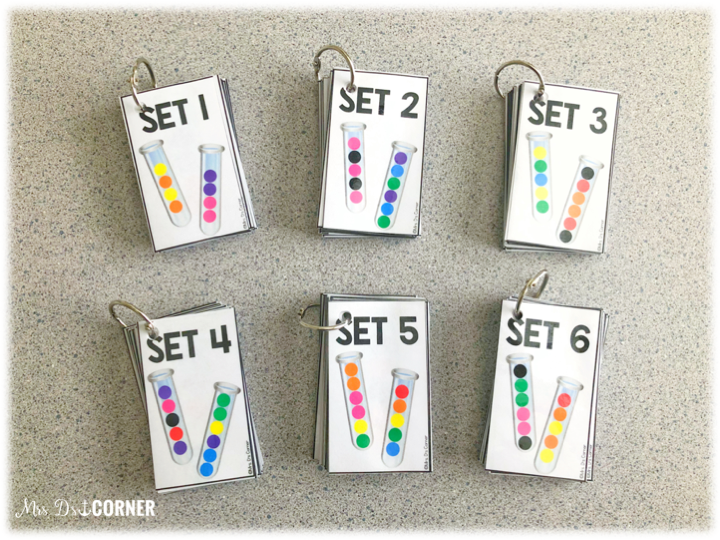 Print the Test Tube Pattern Cards, laminate and add to a binder ring. Grab a few test tubes, plastic or glass (your preference!) and some craft poms. I found mine at Michaels, but they are glass. I’m going to keep my eye out for some plastic ones, just incase. 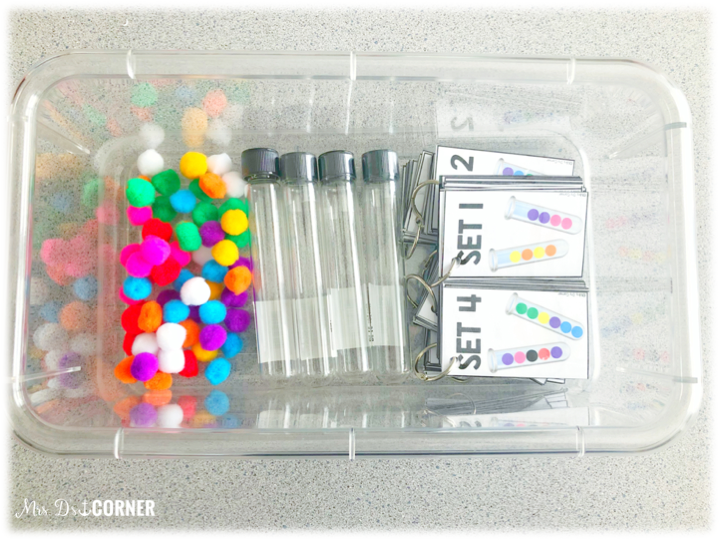 You can store all of the center supplies in one plastic bin, or take a few cards and some craft poms and store them in one of those photo containers for smaller storage. Both work! 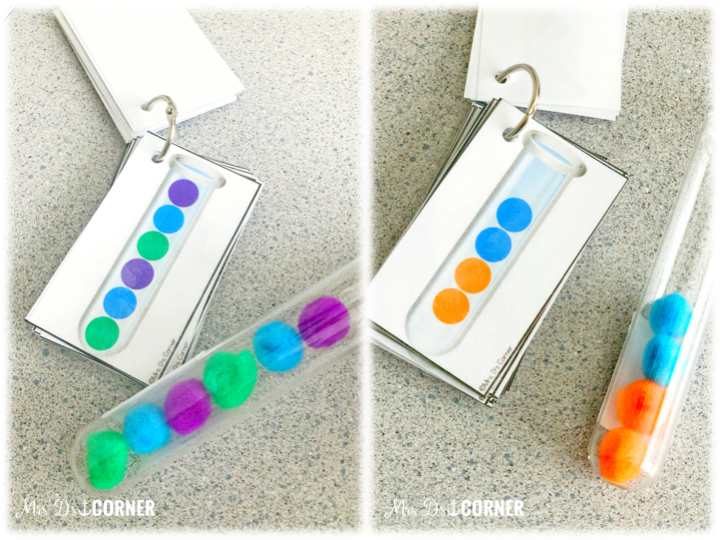 Store them to fit your needs and your classroom. 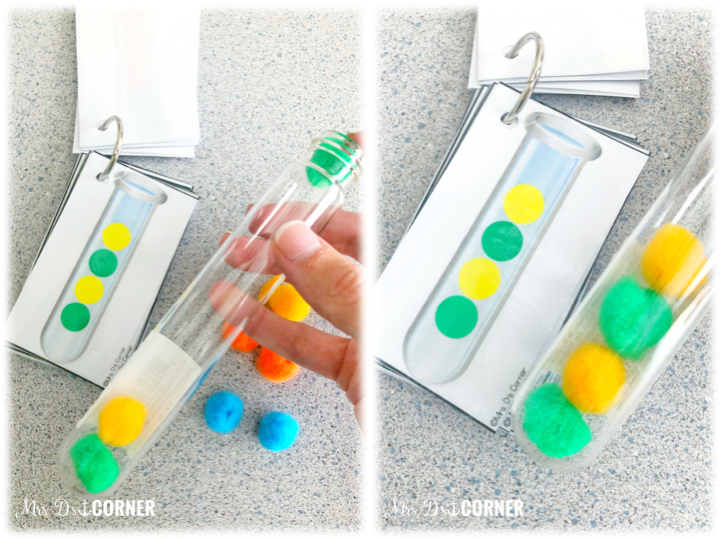 To complete the task, the student will have one card, one test tube and the appropriate color and amount of poms. 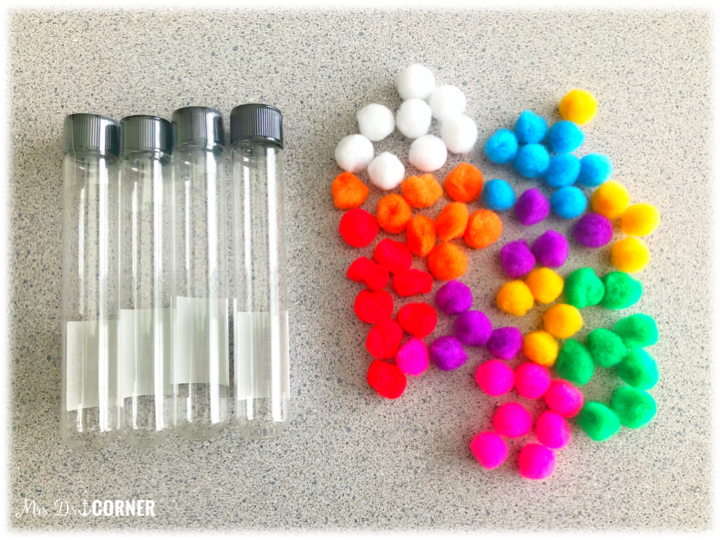 You can easily increase the difficulty of the task by giving the student a couple more poms, or letting them have all of the poms and allowing them to pick out the correct colored poms to complete the task. 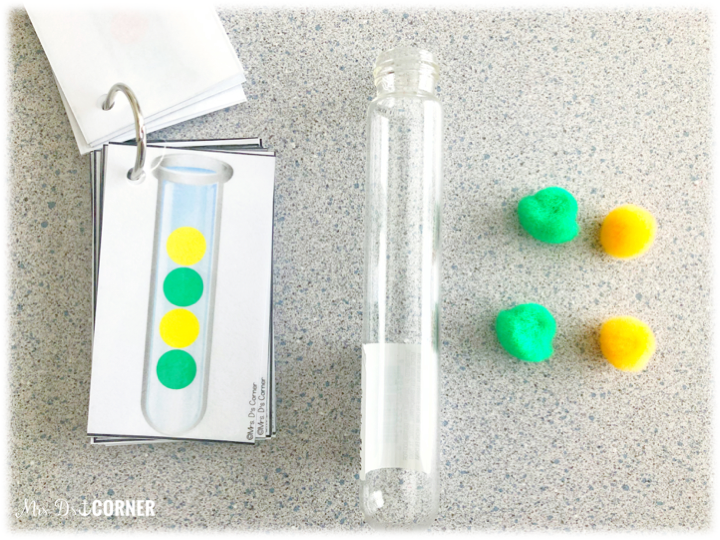 You can easily have multiple students working with the same work bin at once with this center too, as a whole group activity or small group. 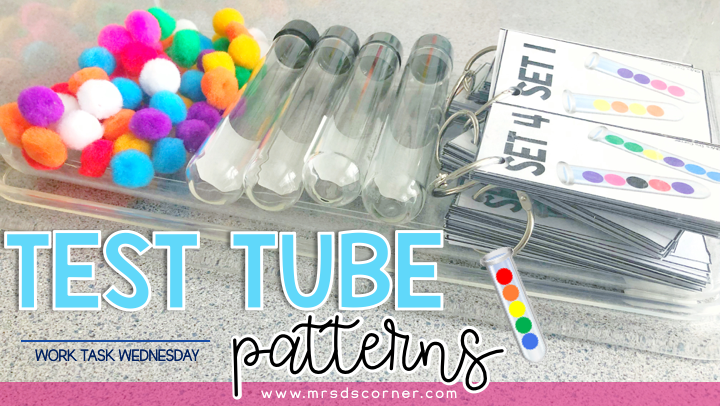 There are 6 different pattern levels included, for a total of 196 different test tube pattern cards. This is a center you can use all year and easily change out with different cards or even sparkly poms! Share your work bin ideas, tips and tricks in the comments below!